We walked a short way at Shugborough Estate the other day, It was a mixture of bright sunshine and dull sky. It was bitter outside but still. I think I may have migraine today I feel….slightly jittery inside, I have a headache and I feel nauseous. I have had more lately than I have had for a while. I was musing through my bookmarked sites this morning and spent some time on Goodreads. I love books and have probably read thousands throughout my lifetime. These days I find I am not able to read more than one book at a time, and when I do I have to keep reading it regularly at a steady pace because I forget who the characters are. The complexity of the links between the characters become confusion if they are not explained when they are introduced. I used to be able work out the relationships and connection between the characters which becomes frustrating because I am constantly having to re read parts to get them. This is a shame as I have so many books lined up to read! Currently I am reading The Almond Tree by Michelle Cohen Corasanti which promises to be an excellent story with lots of characters whose connections are important. The names which are not English are unfamiliar to me which will make it slightly harder to remember, but I am excited to read this book. Am I a pensioner now with the recent changes? who knows. I have washed up, cleaned the bathroom, cleaned and washed out the cats litter tray, I have undertaken the mammoth task of hoovering up all the paper cat litter bits that they walk out with them. At 2.30pm we got wrapped up and armed with his new GPS gadget Mr Hs and I walked out of the marina and turned left to do some geocaching nearby. Having got down onto the towpath we walked towards the first nearest cache, but it seems that the GPS system is so complicated that it was taking a while to understand. Whilst Mr Hs was working out how accurate his GPS toy was I walked 300 metres further down the towpath and finally found my first cache, yippee! I wrote the date and mrs hsg on the list and replaced it. On to the next one back down the towpath, this time Mr Hs found it in a hole in a piece of concrete, dripping with water. The walk back was torturous both Mr Hs and I had not walked this far for several months and joints and muscles were screaming that maybe we had walked too far! The birdsong as we walked was stupendous, both noisy and beautiful announcing that spring is just around the corner. I can’t wait to take the boat out knowing that there is no reason to hurry back. 18/02/13 – We got up early and trundled off to Burton Treatment Centre for my eye check up appointment, only to find I had somehow mixed up the days in my head and the appointment is next Monday. I knew my appointment was on the 25th but simply did not seem to connect the day being the 18th. Mr Hs said several times that he must remember to write this down to tell the memory clinic. Ok wrong day, but it got us up out of bed and out. 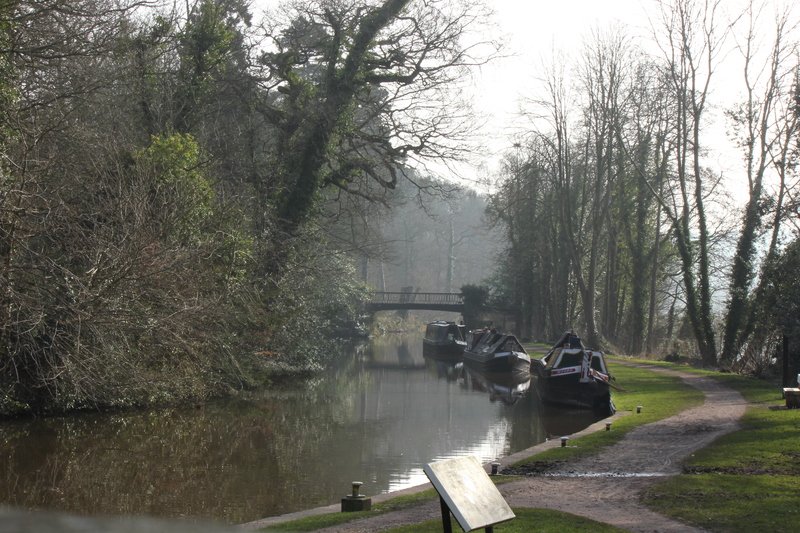 Author GillPosted on 21 February, 2013 21 February, 2013 Categories My Alzheimer's JournalTags Alzheimer's journal, canals, daily blog, honesty, Life, Memory, narrowboats, thoughts, Trent & Mersey Canal", WalkLeave a comment on Am I a pensioner now with the recent changes? who knows. Lately I notice that anything I say is not quite right and has be adjusted, or has to be embellishes with a greater knowledge than mine. It irritates the hell out of me not because of Alzheimers but because it is belittling and I find it difficult to bite my tongue and not say anything rather than start a dialogue that would not be productive to either of us. He is angry with me. I have always found it hard to be impressed by people, I think that my childhood taught me that the wise words by Maya Angelou was the only thing that mattered, “I’ve learned that people will forget what you said, people will forget what you did, but people will never forget how you made them feel”. If someone tells me something new, or adds to what I have said I listen and enjoy the extra knowledge, but when someone challenges a simple statement to try and show that it was incorrect by changing the context, then I feel irritated. Maybe the fact that I have developed these life changing illnesses frustrates or is the focus of disappointment. When we attend the next appointment at the memory clinic, Mr Hs will be expected to record any changes…irritability, ‘oh yes’, he can say ‘she is more irritable’, and no one will ask me why. But I can write it down. Author GillPosted on 13 February, 2013 13 February, 2013 Categories My Alzheimer's JournalTags Alzheimer's journal, canals, daily blog, honesty, Life, Living on a boat, Memory, narrowboats, snow, thoughts, Walk, winter daysLeave a comment on Irritable..